It’s hard to imagine there has been a better year for coach Mary ‘Kissy’ Walker. The 2016-17 season produced a 23-win season. A conference championship. A NCAA tournament game win. Three Coach of the Years honors. And now, induction into the Maine Basketball Hall of Fame. From playing for the Cony Rams in high school to running the point at the University of Maine to becoming a legendary college coach, basketball has been in the blood of Kissy Walker. Born in Santa Anna, California, Walker came to Augusta and played for Cony High from 1981 to 1983. She was named a Bangor Daily News Third Team All State player in ’81. Her four-year letter winning college career at UMaine began in 1982-83, playing for coach Eileen Fox and then Peter Gavett. Walker played in 80 games and recorded 220 assists and 110 steals. The Black Bears went 71-38 during that time period. She was a captain during her senior year on a team that had a 22-7 record and at one point during the season had an 18-game winning streak. Walker dished out 62 assists that season. Upon graduation, Walker taught physical education and coached at Holbrook Middle School for two years. She came to Husson as an assistant coach under her former college teammate Lauree Gott. When Gott took the coaching job at Northeastern, Walker was named Husson’s head coach. With the exception of a two year hiatus to finish her Master’s Degree and focus on the adoption of her son, she has been on the bench at Newman Gymnasium ever since. 27 years at Husson, 26 years as the head coach. She is the longest tenured head coach for a single sport in school history. What a run it has been! 469 wins. A winning percentage of better than 65%. Four appearances in the NAIA national tournament, including the 1992-93 team that went 28-3 and played all the way to what was then called the ‘Fabulous Four’ championship. Since affiliating with the NCAA, Walker’s team have made five national tournament appearances, including this past season when her Eagles won their first NCAA game in school history. 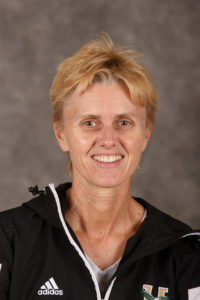 Walker won North Atlantic Conference, New England Women’s Basketball Association and ECAC New England Coach of the Year honors. Over the years, she has been named a conference coach of the year 11 times. Along the way, Walker has coached 16 All-American players. 14 of her players are in the school Hall of Fame. Coach Walker is a member of the Husson University Sports Hall of Fame and the New England Basketball Hall of Fame. Along with her coaching duties, she serves as Husson’s Director of Wellness and is a part-time faculty member. Coach Walker lives with her son, Isaiah, in Orono.